Global warming is a reality that faces humankind. The world has embraced this fact (albeit a few individuals trying to make things ‘great’ again) and has steadfastly begun the fight against it. The European Union was one of the first bodies to start initiatives and issued directives to combat the same. Starting from the renewable energy policy set out in 1997 with a target of 12% penetration of renewables by 2010 these directives have come a long way with the latest energy policy for 2050 targeting an ambitious 85-90% reduction in greenhouse emissions. Achieving this can curtail the global temperature rise but it is no mean task!. The member nations of EU have already embraced the fact that achieving this will be possible only if the electrical power sector emits zero carbon since making the emissions zero in transportation and agricultural sector will be very challenging. This will need a future electric grid dominated by renewable clean sources with a shift away from fossil fuels. Elsewhere in other parts of the world Asia, south America, Africa is seeing their own electric energy revolution with increased installation in the form of renewable sources. We will witness more and more penetration of the renewable energy sources in the grid in the coming years leading to a transition of electric grid away from the conventional fossil fuel based sources. There will also be a shift away from the conventional centralised generation concept where a single large generation facility generates power far from the load centres which will then be supplied through transmission and distribution networks. Renewable energy penetration will result in distributed generation to maximise the tapping of renewable sources . In the EU the penetration of renewable energy is close to 30% of the total electricity production. The increased contribution from the renewable sources especially wind, solar is encouraging but it comes at a cost. They can destabilise the grid, cause power outages and blackouts if introduced in large amounts which most of us can´t even imagine nowadays. So why is this happening?? The main issue with these sources like wind, solar power is that we cannot control the instances when the power is generated in comparison to the traditional fossil fuels where the power generation is varied based on demand. A simple way of explaining this is considering the case of solar power. The sun shines during the day generating power, but usually the power demand is low during day time. Therefore, there is more power generated than what is needed but when the electric power is most needed in the night for the lighting and other loads there is no sun to generate power. This supply-demand imbalance is detrimental to the stability of the grid. Another issue with the green power sources is the reduction of the inertia in the grid. The traditional multiwatt induction generator are now replaced with low inertial sources which make the grids weak. So are we actually creating more problems for us with renewable sources?? The storage of electrical energy is not a very new concept. In the beginning of 20th century lead acid batteries were used as storage by generating stations to deliver power at night instead of generating units. One of the high capacity storage system used initially was the pumped hydro storage (PHS). PHS achieves energy storage by pumping water from a lower reservoir to a reservoir at higher elevation using surplus power from grid. The energy is stored in the form of potential energy and later used for the generation of electricity when needed thus acting like the reserve. Initially PHS was used mostly as a fast responding reserve for slower systems like nuclear plants. The need for more storage systems is obvious but the role of PHS as a storage medium is diminishing despite the high storage capability (largest PHS in Bath county at 3 GW) and roundtrip efficiency (85-90%). This is mainly due to the environmental concerns behind setting up new PHS facilities with many projects already scrapped due to such non viability and the high investment costs involved. Nowadays many new alternatives are looked into for storage . One such storage method is the power to gas plant. These plants use the surplus power from the grid for generating gas (usually hydrogen using electrolyser) which will be used as energy reserve. The hydrogen will then be used to deliver power back to grid using fuel cells or used for heating purpose . Fuel cells are energy conversion devices which uses chemical energy from fuel (hydrogen) to generate electricity. These devices when used in conjunction with electrolysers form energy storage systems. Fuel cell in terms of operation principle is similar to a battery. Unlike batteries though, they are not self-contained and use external fuel to generate electricity through chemical reactions. This usage of external fuel enables a fuel cell system to store large amounts of energy in the form of fuel. Hydrogen storage with fuel cells to generate electricity are finding various applications in the energy sector for example, fuel cell cars (toyota), trains (ABB) and electricity grids. Many power to gas plants are also being are being commissioned in Europe and USA. Power to gas storage though appealing has significant hurdles to overcome to become an effective storage method. The primary concern with this type of storage is the low roundtrip efficiency of 30-40 %, secondly there are issues with storage of hydrogen and finally cost of per unit power generated from this is high. Government incentives, mass production along with intensive research in this area can help overcome these issues. Batteries as a storage device is something which has been employed for a long time. As mentioned above lead acid batteries have been used as storage device in generating stations earlier. The battery technology suffered in the earlier days due to poor cycle life times, harmful discharges and limited reusability. The proposal for Lithium ion batteries in the 1960s from the Bell labs was a major breakthrough for the battery technology. The lithium ion batteries were able to transform the batteries into a more efficient storage medium due to the high life time, energy density and low environmental impact of lithium ion batteries. Nowadays they are increasingly used in cars (Tesla), for uninterruptable power supplies and as storage facilities in grid. In comparison with PHS and hydrogen storage the storage capability of the batteries is limited and usually falls under category of medium scale storage. Flow batteries are another family in the battery technology which is being promoted for storage applications. Unlike batteries the technology of flow batteries is not very matured yet. Another group of storage systems widely employed are the supercapacitors. They are capable of storing more energy and having higher capacitance value (range of Farads) than the standard capacitors and as such can be used for storage applications in grids. They are characterised by high power delivery capability. This makes them more suited for ancillary services to the grid like reactive power compensation, reducing voltage flickers and meeting sudden changes to the demand in the grid. Both batteries and supercapacitors are highly efficient with round trip efficiencies in the range of 85-90%. Apart from the above mentioned storage systems there are others like flywheels, superconducting magnetic storage, compressed air energy storage to name a few. Apart from flywheels the other storage mechanism mentioned here are not widely used. In order to ensure maximum utilisation and highest possible lifetimes of storage systems its necessary to use the different storages- large (PHS/hydrogen), medium(batteries) and small (supercapacitors) scale storages- together in the same application (grid or automotive) forming a hybrid storage system. This enables them to complement each other in their operation and form a more efficient, reliable storage network. In the future we will witness hybrid storages operating in the grid complementing each other to improve the reliability of the storages and at the same time provide energy security, improved power quality and increased penetration of renewables ,. The future grids will see the renewable sources being supported by the electrical storage systems working towards meeting the targets set. There is still room for advancements in many storage technologies like the electrolyser-fuel cell system which currently works at low efficiency (30-40%) though they provide large energy storage capability. Hybrid storages with different types of storage systems in the grid is becoming prominent and is considered a solution to overcome the drawbacks of the individual storage technologies. The modern electric grids are in a phase of transition and the storage technologies will play an important role in this transition while we are striving to achieve environmental friendly electric grids. G. Pepermans, J. Driesen, D. Haeseldonckx, R. Belmans, and W. D’haeseleer, “Distributed generation: Definition, benefits and issues,” Energy Policy, vol. 33, no. 6, pp. 787–798, 2005. C. J. Yang and R. B. Jackson, “Opportunities and barriers to pumped-hydro energy storage in the United States,” Renew. Sustain. Energy Rev., vol. 15, no. 1, pp. 839–844, 2011. G. Gahleitner, “Hydrogen from renewable electricity: An international review of power-to-gas pilot plants for stationary applications,” Int. J. Hydrogen Energy, vol. 38, no. 5, pp. 2039–2061, 2013. 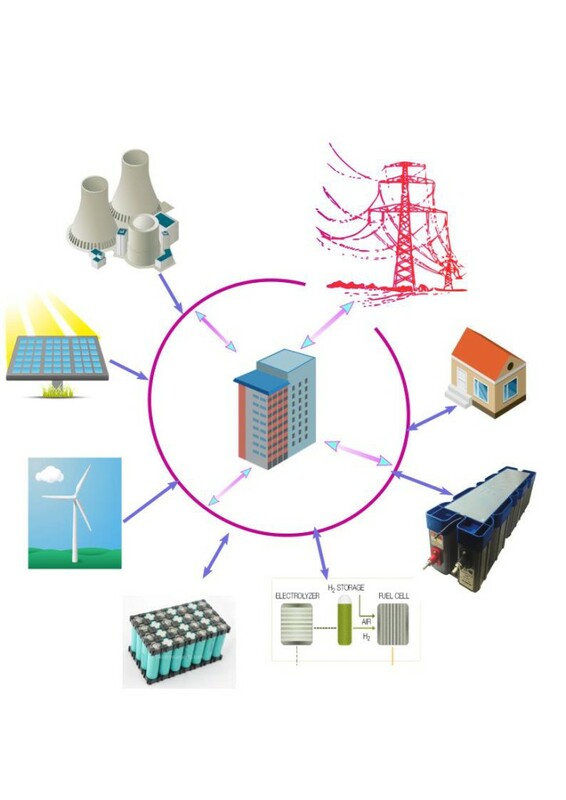 H. Chen, T. N. Cong, W. Yang, C. Tan, Y. Li, and Y. Ding, “Progress in electrical energy storage system: A critical review,” Prog. Nat. Sci., vol. 19, no. 3, pp. 291–312, 2009. M. S. Whittingham, “History, Evolution, and Future Status of Energy Storage,” Proc. IEEE, vol. 100, no. Special Centennial Issue, pp. 1518–1534, 2012.